Foreign Affairs Minister Chrystia Freeland released Canada's list of key demands Monday for a new North American Free Trade Agreement as talks get set to begin in Washington later this week. Here's a look at the list. 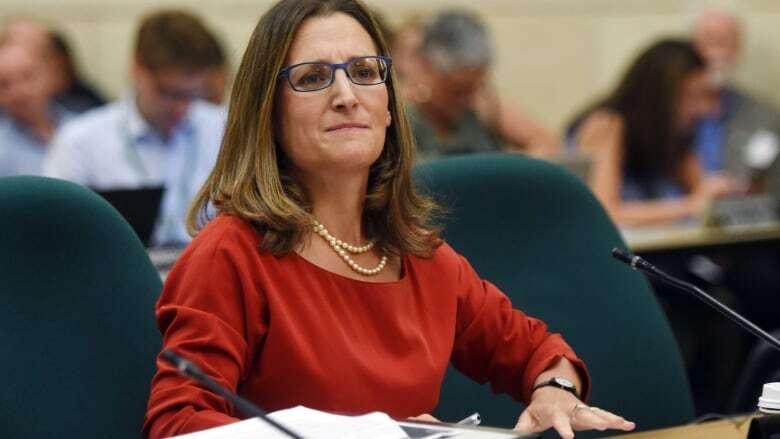 Foreign Affairs Minister Chrystia Freeland released Canada's list of key demands Monday for a new North American Free Trade Agreement as talks get set to begin in Washington later this week. The original NAFTA included a labour section as an addendum, inserted into the agreement after Bill Clinton was elected and insisted on a few changes. Some officials in Canada and the U.S. have identified a goal of tougher labour rules: Increasing Mexican wages, to make auto plants in the other countries more affordable. This was also added as an afterthought to the original NAFTA, placed there after Clinton's election. Freeland says she wants a chapter that ensures no country can weaken environmental protection to attract investment. She also says it should support efforts against climate change. Specifically, Freeland referred to Chapter 11 — which involves companies suing governments. She said she wants reforms so that "governments have an unassailable right to regulate in the public interest." This is not to be confused with Chapter 19, which regulates disputes between companies over dumping, in cases like softwood lumber, and which the U.S. administration might seek to eliminate. For years, Canada has wanted to kill Buy American rules for construction projects at the state and local level. It could be a tough sell. U.S. lawmakers are demanding even more Buy American rules, which is something President Donald Trump campaigned on. Freeland said: "Local-content provisions for major government contracts are political junk food: superficially appetizing, but unhealthy in the long run." NAFTA includes a list of professions where people can easily get a visa to work across the border. It's an old list — it mentions land surveyors and range conservationists, but not computer programmers. International companies want this list expanded to make it easier for employees to move between offices. Canada does not have free trade in these areas, and regulates imports and prices. Canada insisted on protections in the old agreement for cultural industries, like publishing and broadcasting. The U.S.'s annual report on international trade barriers lists this as an irritant. Freeland noted that Canada briefly walked out of the original talks in 1987, as this was a deal-breaker. The U.S. says it now wants to get rid of the resulting Chapter 19. Some observers say it might simply be modified.